After reading D his bed time story I walked over to turn out the light. Something caught my eye at the window and I found this little fellow staring up at me. 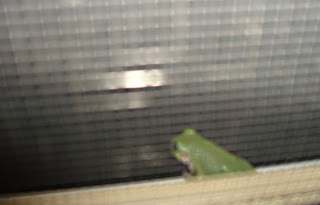 A teeny weeny little green frog sitting on the ledge of a second story window! Perhaps he needed a bedtime story too. He stayed for quite a while but was gone in the morning. I sure do hope he got down safely.